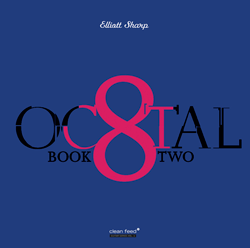 Like its predecessor on the same label, Octal: Book Two represents Elliott Sharp’s automatic reaction to one in particular among the many books he eagerly reads, responding to Lisa Randall’s Warped Passages (“a compendium of current thought in post-quantum physics and the state of string theory”). In typically ir/rational fashion the seven pieces are essentially compositions, but Sharp’s approach is genuinely tinged with an instantly recognizable improvisational style, enhanced by the will of not subjecting the timbre of his 8-string Saul Koll to excessive modification. No processing was except for a minimum of compression and reverb, the basic sound coming out of a plethora of strategically employed amplifiers, mixers and microphones (plus the eBow that typifies “Inverted Fields”). In an ironic reference to certain reviewers who had attributed the sounds of Octal: Book One to complex chains of effects, Sharp affirms that this music is indeed “digital”, since it’s the fruit of his digits at work — without plectra, for good measure. Two main sonic features define E#’s research in this ambit. The first is, quite evidently, the ceaseless roll-and-tumble tapping of those thick wires on the fret board characterizing the large part of the album, a technique that has been thoroughly explored by the artist for decades. The second is the exploitation of the nodal points of a specific tuning (in this case Eb Bb Eb Bb E Gb Bb Eb) to create a blend between the muddied twinkling of the upper partials and the global resonance — or “alternate dronal system”, as per the composer’s definition — of the instrument in its wholeness. The sum of the parts gives life to a hybrid of sorts, unconscious references to illustrious past opuses sweetened, so to speak, by original viewpoints on the “quieter” hues of the timbral palette. The resulting cross of reiterative interlocking patterns and intelligibly grimy pitches produces a harmonic fullness that is innovative and also familiar, spotlighting individual traits that once were the origin of acculturated growls permeated by political incorrectness. Now a different kind of stone is thrown against the ordinariness of self-expression: less jagged in a way, yet still dangerous when compared to the hollow-body mellowness of other established practitioners.